Next up is the point & figure chart for GLD, the gold exchange traded fund. It shows a bullish trend with a significant upside price projection. 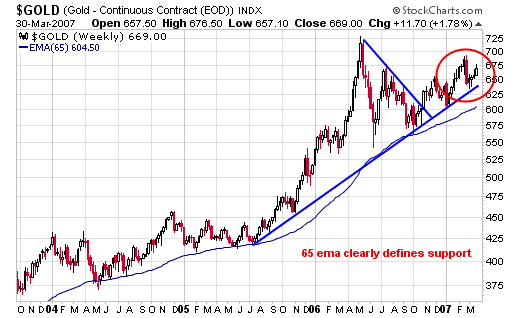 Below is one of our favorites: the long term chart of gold going back to 1975. As you can clearly see, prices peaked in the late 70's at over $750.00, and have recently rallied up to $730.40. In the process a cup formation has been constructed on the chart. 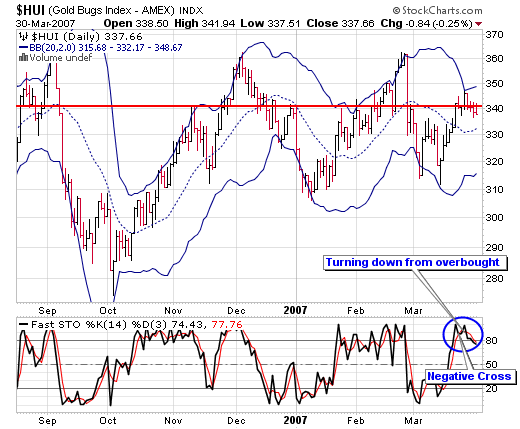 Presently gold has been in a trading range just below the rim of the cup on the right hand side of the chart. If the POG rallies back up through its $730.40 high and on through $750.00 - a very strong cup with a handle formation will be in place with a break out that would signify the gold bull is very strong and entering a new phase. We expect that to happen this year, possibly within a few months time. Next is the industrial metals compared to the price of gold. 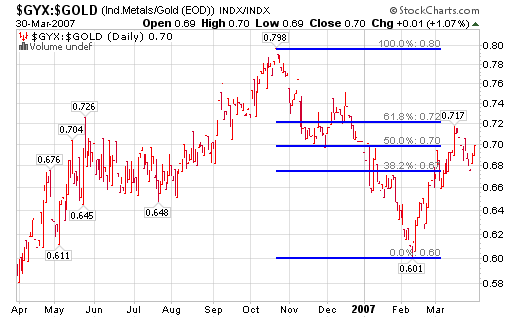 Since late October of 2006 gold has been out performing the industrial metals, which prior to that time had been the leader. 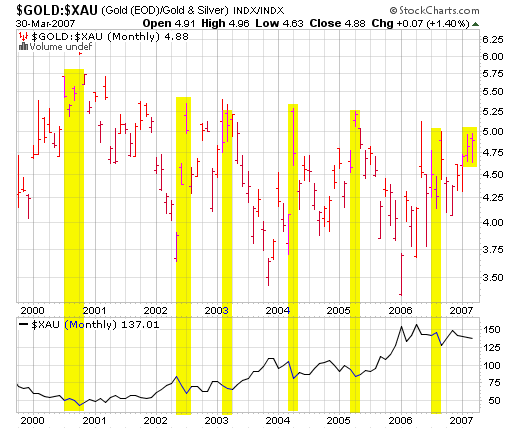 Since the peak in late October of 2006, gold has been out performing until about mid-Feb. of 2007. From mid-Feb. to mid-March the industrial metals rallied back to their fib retracement level of 61.8%, and have since started to fall once again, meaning gold has been out performing as of late. Below is the chart of the silver exchange traded fund (SLV). It is presently right at the top of a resistance band and is trying to break out above. A close above 135 that holds would be bullish. The second chart below is the point and figure chart for silver, which shows a bullish price projection of $21.50. The Hui Index was down 3.20 for the week, closing out at 337.66 (-0.94%). The daily chart below shows a symmetrical triangle that is getting narrower by the day. Price will soon break out to the upside or downside. Notice the series of higher lows that have been kept in place. 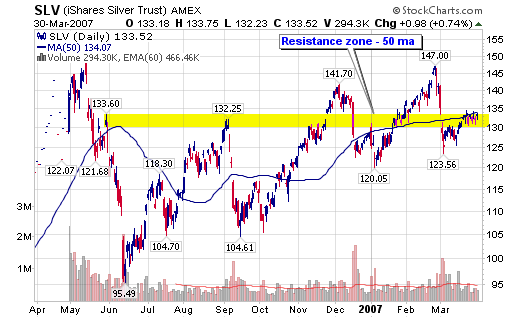 Significant resistance resides overhead just over the 360 level. Next up is another daily chart of the Hui; this one has a much shorter time frame, and tends to focus in on the more recent price action. Notice the Bollinger bands on the chart. The upper BB is at 348.67 and the lower one is at 315.60. In between the two is the middle band at 332.17. The index just recently banged up against the upper BB line and has since retreated to 337.66, which is 5 points above the middle BB. If prices do not hold right around the middle band then the lower band will become a target. Stochastics are turning over and down. Below is the point and figure chart for gold that shows a bullish price project of 412. Readings of 5 or higher have coincided with oversold levels and market bottoms. A spike back above 5 from which the ratio has recently fallen would most likely give a good entry point. Below are some gold stocks that we own or have owned in our portfolio and are watching for further possible accumulation. We are cautious with the overall stock market and sense there is more downside to come. 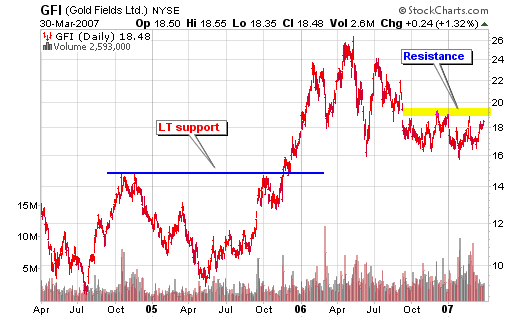 We prefer to stay on the sidelines except with selected precious metal and energy stocks. Even with the pm and energy stocks one most remain cautious, as any serious downdraft in the overall market will most likely affect all stocks. We do not see any imminent danger, but storm clouds on the distant horizon. Any surprises with interest rates will be to the upside. This is because of the derivative mess and carry trade orgies, which when they start to unwind will cause quite a stir. The world is afloat with paper fiat debt money. The sub-prime problems will get worse before they get better, not only in the US but elsewhere as well. The Fed and other CB's will react to these events as they do to all events: they create more credit and debt. This will not be unseen by gold, as a matter of fact gold will sound the warning before hand. 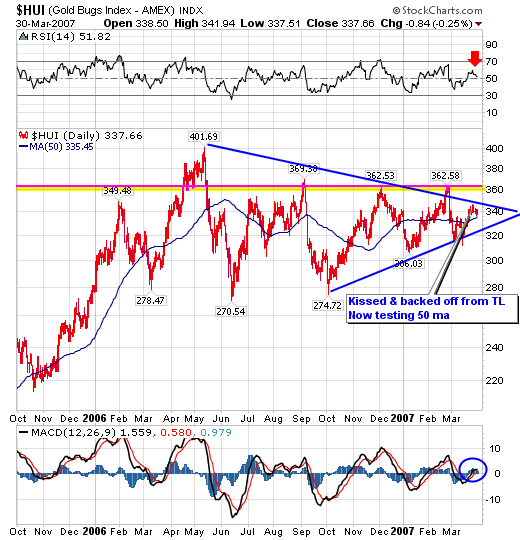 Short term the gold stocks appear overbought and in need of a bit more rest/consolidation before beginning a sustainable leg up. We look to accumulate selected stocks on weakness that holds above previous lows. Stop by our website and check out the complete market wrap, which covers most major markets. There is also a lot of information on gold and silver, not only from an investment point of view, but also from its position as being the mandated monetary system of our Constitution - Silver and Gold Coins as in Honest Weights and Measures. There is also a live bulletin board where you can discuss the markets with people from around the world and many other resources too numerous to list. Drop by and check it out. Good luck. Good trading. Good health. And that's a wrap.